With the untimely death of Pebble, Father Christmas brought me a Ticwatch 2. Ticwatch doesn’t ship directly to NZ yet, so FC had to hunt around for an overseas supplier who would ship to NZ - he used Amazon (or you could use NZ Post’s excellent “You Shop” service to buy directly from Ticwatch in China). FC also used TradeMe to replace the silicone band with a metal one, effectively making the US$200 watch look like a Ticwatch Onyx (the US$300 model). The Ticwatch is round, like a classic watch, and available with either a black or white coated aluminium case. It’s light on the wrist, weighing in at about 55g with strap - much lighter than my Pebble Time Steel. Like Pebble, Ticwatch has their own app store. Unlike Pebble, there is nothing worth having in it yet. I brought the Ticwatch for its standard pre-loaded apps; my experience with Pebble being that after the initial surprise of finding that you can run, say, Evernote, on your watch, it becomes glaringly obvious that using it on a watch is like trying to whistle into the wind - an exercise in futility. Most third-party watch apps tend to be a bit like this. Out of the box, the Ticwatch can tell the time, display notifications, make and receive phone calls (via a paired phone), reply to SMS messages, count your steps, track a run (or in my case, a walk), measure your heart rate, show calendar entries, show and speak the weather, play music on a bluetooth device, provide both stopwatch and timer, record spoken notes, and do simple calculations. Oh, and call an Uber (or other taxi services) though I haven’t used that yet. That’s not a bad list of functions and is much more than I used on my Pebble. My only real complaint about the Ticwatch, is the screen. Indoors, it’s a lovely brilliant, 36mm, OLED screen with 287ppi resolution. But, like all LED-based watches, it becomes very difficult to read outside on a bright day - even with the screen set at maximum brightness. Pebble had it right by choosing to use a colour e-paper display - clearly visible on the brightest of days. Right now, however, there are no decent e-paper watches - nearly all manufacturers are using one type of LED or another (though Sony has an e-paper watch in development). The choice of LED display also impacts heavily on battery life. Whereas the Pebble lasted well over a week between charges, the Ticwatch will last just over one day. This is par for the smart-watch course, but turns out to be less of a problem than I had originally thought - it simply means putting the watch on charge each night - along with the phone. At the end of a 16 hour day, the Ticwatch has between 33% and 48% of the battery remaining (I’m keeping count) - that includes some GPS use and heart rate monitoring each day. As I get used to the pattern of battery drain, my initial ‘range anxiety’ has reduced and I am getting more comfortable with the practicality of a shorter battery life. From a style perspective, the Ticwatch is a much more ‘watchy’ looking watch than the Pebble Time Steel and, even after buying a metal band, it’s still a little cheaper than the squarish looking Pebble. In fact, outdoor visibility aside, there’s really nothing to dislike about this watch. Probably its nearest competitor would be a Samsung Gear S2 - a NZ$400 watch that has now been superseded by the Gear S3 at over NZ$600. Mine ended up costing NZ$340 with the metal band. 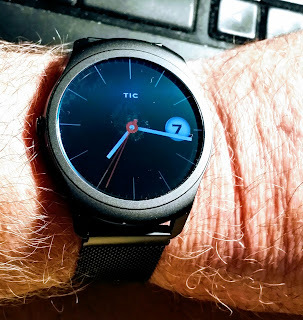 If you are interested in snagging one, the Ticwatch site is here: https://en.ticwear.com and just search Google for “Ticwatch review” to see what others think about this watch. Goodness, look at the time ... must fly. Update April 2017: My Ticwatch has been consigned to a draw and I can no longer recommend it. The hardware remains good but Mobovi clearly do not have robust software development and release processes in place. Each update of the software creates new problems. Even when beta testers have identified the issues during testing, the final release contains those same problems. The consequence is that every software release, the watch gets more broken. I am not a happy camper.